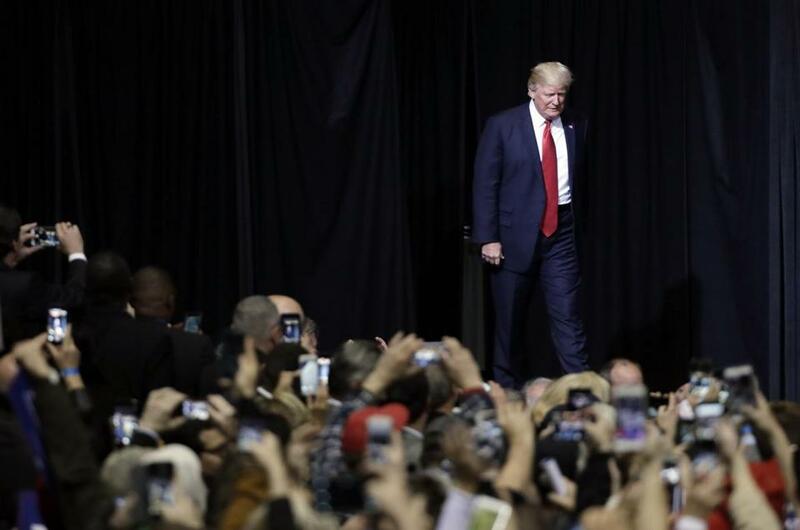 President Donald Trump walked to the stage to speak at a rally Wednesday night in Nashville, Tenn.
NEW YORK — A federal judge in Hawaii issued a nationwide order Wednesday evening blocking President Trump’s ban on travel from parts of the Muslim world, dealing a stinging blow to the White House and signaling in pointed language that Trump will have to account in court for his heated rhetoric about Islam. The ruling was the second major setback for Trump in his pursuit of a policy he has trumpeted as critical for national security. His first attempt to sharply limit travel from a handful of predominantly Muslim countries ended in a courtroom fiasco last month, when a federal court in Seattle halted it. In his blistering 43-page opinion, US District Judge Derrick K. Watson declared there was a ‘‘strong likelihood of success’’ that those suing would prove the directive violated the Constitution. ‘‘The illogic of the Government’s contentions is palpable,’’ Watson wrote. Trump reacted to the setback with fury, as he did in response to the earlier ruling. 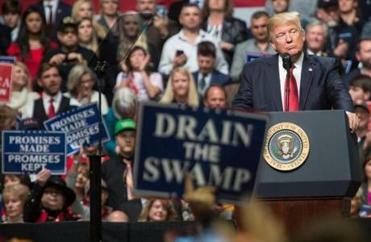 At a rally in Nashville Wednesday night, raising his voice to a hoarse shout, Trump criticized the judge, as well as the Ninth US Circuit Court of Appeals, which upheld the earlier court ruling and will hear any appeal of the Hawaii decision. After the first judicial defeat, Trump issued a new and narrower travel ban on March 6, trying to satisfy the courts by removing some of the most contentious elements of the original version. After he signed the revised ban, Democratic attorneys general and nonprofit groups that work with immigrants and refugees raced back into court, alleging that it was still a thinly veiled version of the ban on Muslim migration that he had pledged to enact last year, as a presidential candidate. Watson, a federal judge based in Honolulu, ruled that the state of Hawaii and an individual plaintiff, Ismail Elshikh, the imam of the Muslim Association of Hawaii, had reasonable grounds to challenge the order as religious discrimination. And he concluded that allowing the travel restrictions to go into effect at midnight, as scheduled, could have caused them irreparable harm. Watson, an Obama appointee, flatly rejected the government’s argument that a court would have to probe Trump’s “veiled psyche” to deduce religious animus. He quoted extensively from Trump’s campaign remarks that Hawaii cited in its lawsuit. Watson singled out Elshikh, an American citizen whose Syrian mother-in-law had been pursuing a visa to enter the United States, as having an especially strong claim that the travel regulations would harm him on the basis of his religion. Administration lawyers had argued in multiple courts Wednesday that the president was merely exercising his national security powers. In addition to the Hawaii suit, federal judges in Washington state and Maryland heard arguments in two cases challenging the constitutionality of Trump’s order: one brought by a coalition of Democratic attorneys general, and another from a collection of nonprofit groups. In the scramble to defend Trump’s order, a single lawyer in the US solicitor general’s office, Jeffrey Wall, argued first to a Maryland court and then, by phone, to Watson in Honolulu that no element of the executive order, as written, could be construed as a religious test for travelers. Wall said the order was based on concerns raised by the Obama administration in its move toward stricter screening of travelers from the six countries affected. “What the order does is a step beyond what the previous administration did, but it’s on the same basis,” Wall said in the Maryland hearing. Trump’s original ban, released on Jan. 27, unleashed scenes of chaos at US airports and spurred mass protests. Issued abruptly on a Friday afternoon, it temporarily barred travel from seven majority-Muslim nations, making no explicit distinction between citizens of those countries who already had green cards or visas and those who did not. It also suggested that Christian refugees from those countries would be given preference in the future, opening the order up to accusations that it unlawfully targeted Muslims for discrimination. After a federal court in Seattle issued a broad injunction against the policy, Trump removed major provisions and reissued the order. The new version exempted key groups, like green card and visa holders, and dropped the section that would have given Christians special treatment. Trump also removed Iraq from the list of countries covered by the ban after the Pentagon expressed worry that it would damage the United States’ relationship with the Iraqi government in the fight against the Islamic State. Yet those concessions did not placate critics of the ban, who said it would still function as an unconstitutional religious test, albeit one affecting fewer people: an argument Watson concurred with in his ruling Wednesday. The lawsuits have also claimed that the order disrupts the operations of companies, charities, public universities, and hospitals that have deep relationships overseas. In the Hawaii case, nearly five dozen technology companies, including Airbnb, Dropbox, Lyft, and TripAdvisor, joined in a brief objecting to the travel ban. The second, now-halted executive order preserved major components of the original. It would end, with few exceptions, the granting of new visas and green cards to people from six majority-Muslim countries — Iran, Libya, Somalia, Sudan, Syria, and Yemen — for at least 90 days. It would also stop all refugees from entering for 120 days and limit refugee admissions to 50,000 people in the current fiscal year. Former president Barack Obama had set in motion plans to admit more than twice that number. Trump has said the pause is needed to reevaluate screening procedures for immigrants from the six countries before allowing travel to resume. “Each of these countries is a state sponsor of terrorism, has been significantly compromised by terrorist organizations, or contains active conflict zones,” he wrote in the order, signed March 6. Watson’s order was not a final ruling on the constitutionality of Trump’s ban, and the administration has consistently expressed confidence that courts will ultimately affirm Trump’s power to issue the restrictions. But the legal debate will probably be a protracted and unusually personal fight for the administration, touching Trump and some key aides directly and raising the prospect that their public comments and private communications will be scrutinized extensively. The lawsuits against the travel ban have extensively cited Trump’s comments during the presidential campaign. Attorney General Bob Ferguson of Washington, who successfully challenged Trump’s first order, has indicated that in an extended legal fight, his office could seek depositions from administration officials and request documents that would expose the full process by which Trump aides crafted the ban.